Make the switch to smart lighting with the Philips Hue White and Color Ambiance Starter Kit. With four color E26 bulbs and a Philips Hue Bridge, you'll have everything you need to get started in the world of smart lighting. Set schedules, control your light from anywhere, and explore the near limitless color and white combinations. Discover the world of smart lighting for yourself with the Philips Hue White and Color Ambiance starter kit. Light up your home with four color changing bulbs, to create the perfect atmosphere for any occasion. The included Eve Energy is a smart plug that will let you control a traditional mains-powered device with your smartphone and monitor its energy consumption. From multimedia synchronization to highly customizable light scenes, the Philips Hue White and Color Starter Kit has the most advanced smart lighting features on offer. Thanks to the included Hue Bridge, you'll be able to get your new lighting network up and running right away. Additionally, this set comes with the Eve Energy light switch, which will make any connected device smartphone controllable. Discover 16 million colors and whites: In the Hue app you can customize each bulb's color as well as create light scenes to create the perfect atmosphere for any occasion, whether it's a romantic dinner for two or an energizing house party. Multimedia synchronization: Hue lights can change color based on the movie or video game currently on your screen. They respond to audio and visual cues to match the lighting to your entertainment, creating a truly immersive experience. Geofencing: When you enable Geofencing, you will no longer need to worry about turning off all the lights before leaving home. Instead, the light bulbs will automatically turn on when they detect your smartphone is in your home network and turn off when you leave. Energy usage insights: Plugging a traditional device into the Eve Energy will give it smart capabilities. For example, you'll be able to control it with your voice and smartphone. In the accompanying app you'll also get detailed graphs that give you insights into daily, monthly, and yearly energy usage, as well as estimated costs. Hands free access: Using a smart speaker, you can dim, turn lights on and off, and change their colors using simply your voice. The Philips Hue White and Color Ambiance starter kits lets you outfit your home with four dimmable, color changeable light bulbs. These bulbs are fully controllable using your voice or smartphone, which means you'll also be able to access them when you are away from home. The included Eve Energy lets you add a "dumb" device to your connected home, also making it smartphone controllable. Scheduling your lights to run according to your daily schedule means you'll have one less thing to worry about. You can set your lights to wake you up with a cool sunrise simulation each morning to energize you for the day ahead. Then have your lights dim down to a warm white light in the evening to prepare you for a restful nights sleep. 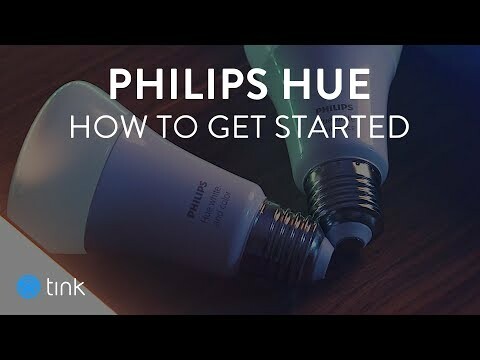 This Philips Hue color starter kit provides you with everything you need to get your smart lighting system started and add more comfort and color to your home. Installation is as easy as screwing in the fours bulbs and following the in-app instructions. The bulbs have a light expectancy of 25,000 hours and all devices are made of high quality materials that are built to last. The Hue app lets you fine-tune lighting settings, choose colors, create scenes, and more. Schedules, scenes, geofencing, voice control, dimming, and energy usage insights. Bulbs and Bridge work together very reliably. Voice control is also seamless. The design is simple and functional. The bulbs and plug look just like their traditional counterparts. The Philips Hue bulbs communicate using the highly secure ZigBee communication protocol. This set gives you everything you need to get started with smart lighting. How many Philips Hue bulbs can a single Hue Bridge control? One Hue Bridge can control up to 50 Philips Hue bulbs. No, these bulbs are designed for indoor use only. Philips Hue does however offer a line of outdoor lights that may be of interest.